It has started out to be an absolutely beautiful March here in Minnesota! We hit a record-setting 70 degrees yesterday in the Twin Cities. Now this type of weather I can handle. Bring on the sunny and 75 for sure. I’m a warm weather girl stuck in this tundra called Minnesota and summer can’t come soon enough. Meanwhile I’ll just sit here and face plant into these light and fruity Lemon Curd Blueberry Parfaits! I was given the pleasure to sample an array of Sweet Home Farms granolas. OMG yum. The flavors that they have are seriously awesome. They are all natural with no GMO, preservatives or added flavors. So straight up farm fresh here! I’m prone to loving blueberry flavors so I was drawn to their Blueberry with Flax. 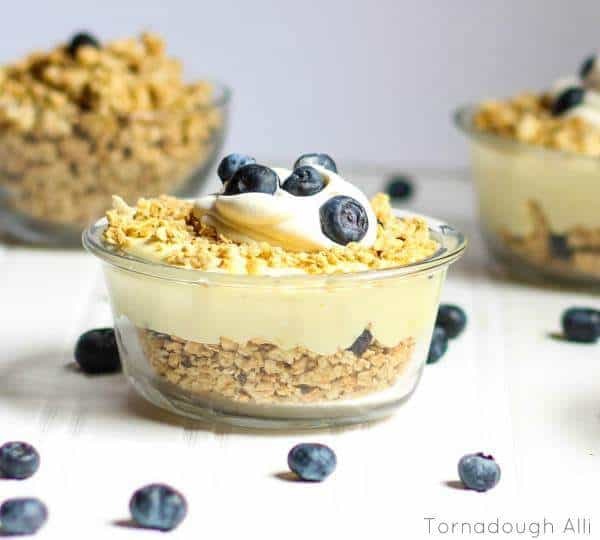 I knew I wanted to use that in a Spring type of recipe so what better than using it in these parfaits! To see all their flavors and recipe inspirations, head over here and check them out! Have you ever tried lemon curd? It is one of the most delicious flavors I have ever put in my mouth. It is so versatile and can be used for toppings, fillings, spreads, parfaits, etc. I decided to turn my curd into a mousse. Pretty much just blended in whipped cream and made it light and fluffy. Don’t let the curd scare you, its pretty simple and doesn’t have a lot of steps to it. The only thing you really need to worry about when making this is it curdling. But if you can keep it from boiling, you’re in the clear!! 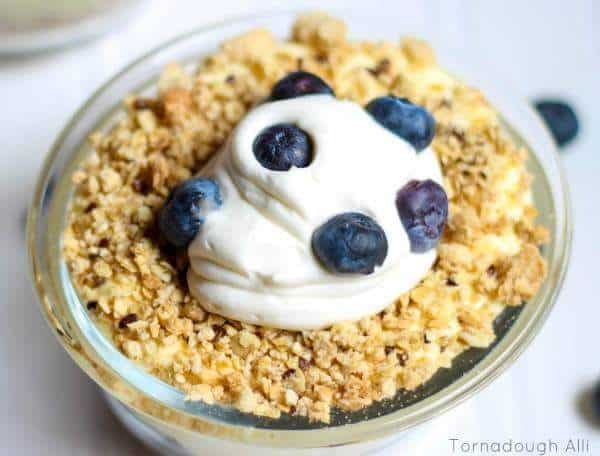 Anyways, layer that up with some of the granola, top with whipped cream and fresh blueberries and you have yourself a tasty, tart but light treat that can be enjoyed for breakfast, brunch, dessert or any time. What would you create with some Sweet Home Farms granola? 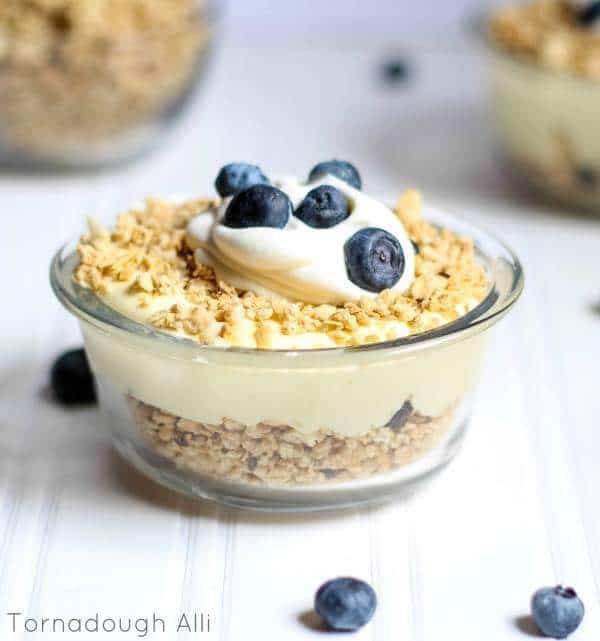 A delicious lemon curd mousse layered with bluberry granola then topped with whipped cream and fresh blueberries. In bowl whisk together your egg yolks and sugar until it turns pale yellow and is light and fluffy. Add lemon juice and salt until blended. Bring a double boiler to a boil over medium high heat and add mixture to top pan (or a glass bowl over a sauce pan). Reduce heat to low and continuously whisk your lemon mixture until thickened, about 15-20 minutes. Mix should be able to coat back of spoon. Once thickened, remove from heat and whisk in your lemon zest. Next add your butter one Tbs at a time until melted. Place saran wrap on top of lemon curd and press down where it is touching it so it doesnt create a film. Refrigerate until cooled. Once lemon curd has cooled fold in your whipping cream 1/3 of the mixture at a time. 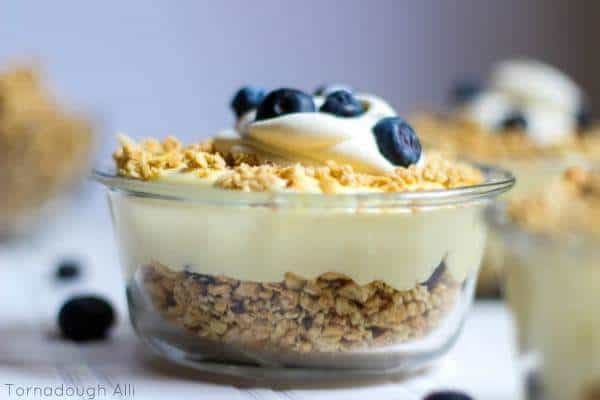 In small bowls or pafait cups sprinkle your granola then layer with lemon curd mousse, and continue layers. Top with any leftover whipping cream and fresh blueberries. Yummy! I love lemon and blueberry together and the granola looks delicious. I’m with you on the weather too, come on 75! My gosh, Alli, it got warmer there than at my folks down here in SD! I’m jealous! I wonder what my garden is doing! These parfaits look gorge! I don’t know if they’re breakfast or dessert or both, haha! That looks like a heavenly breakfast! LOVE lemon curd. I’ve never made it myself. It’s on my list though! Genius that you mixed it with whipped cream. Sounds SO good! Come visit me in Florida ANY time! It’s always hot here. OMG sign me up for FL!! We were there in December and my hubby and I took a trip to Fort Lauderdale a few years ago. I’d gladly come! !